This scarf is quick and easy to make. Even newer crocheters will be making this scarf with ease! 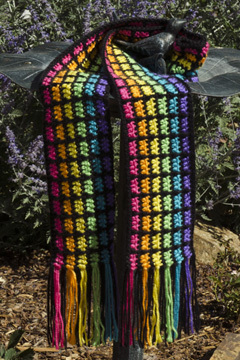 If you already know how to make a chain, single crochet, half double crochet and double crochet, as well as how to read and follow a crochet pattern, you’re ready to make this scarf. The pattern is easy to follow and includes full instructions for making the scarf with the fringe. It also includes close-up photos of the scarf and fringe, instructions and step-by-step photos for working in the back bump of the foundation chain, making a Long double crochet (Ldc), starting a row (joining) with a sc or a hdc and making the fringe. The scarf is completely reversible, thanks to the special stitch worked in the black rows. And, best of all, there are no tails to weave in, since the tails are included into the fringe. Note: Photographed model made with Caron Simply Soft in #9727 Black, #9604 Watermelon, #9605 Mango, #9776 Lemonade, #9607 Limelight, #9608 Blue Mint and #9610 Grape.